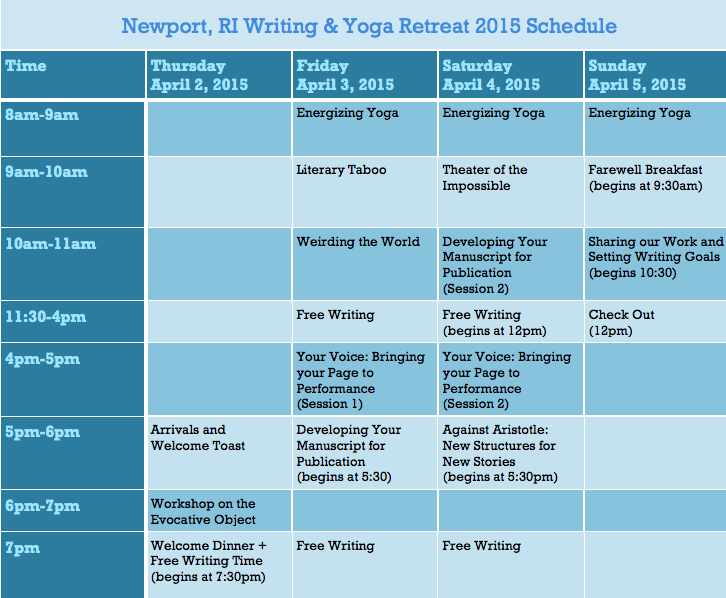 Our Newport retreat offers the opportunity for writers of all genres and levels to work alongside award-winning authors & editors to hone their craft and expand their writing skills, while working on new or existing projects. Famous for its seafood and coastline, we chose this location for its inspiring beauty and history. During free sessions in the afternoon, take a mansion tour of gilded-era Newport, visit the Newport Museum, listen to some Newport jazz classics, or just relax beside the ocean watching the sailboats and let the stunning location influence your writing. During the retreat, writers and yoga practitioners will learn craft techniques alongside award-winning and internationally-renowned authors such as Kathleen Spivack (fiction, poetry, nonfiction), Stephen Aubrey (playwriting, screenwriting), Rita Banerjee (poetry, fiction), & Diana Norma Szokolyai (poetry, nonfiction). Yoga and meditation will be lead by Elissa Lewis. Included in the $650 tuition are all daily creative writing workshops, shared lodging, craft of writing seminars, one-on-one manuscript consultation, orientation dinner, toasts, and farewell brunch, plus daily yoga and meditation classes. Shared room lodging is included. Please send us an email to inquire about partial attendance ($375 or $475 with shared lodging). Please inquire about optional add-ons include aromatherapy, massage, and reiki healing. There are limited seats for this workshop so apply early! There are limited seats, so apply early! The extended deadline for admittance for our retreat is March 15, 2015. Apply at cww.submittable.com. 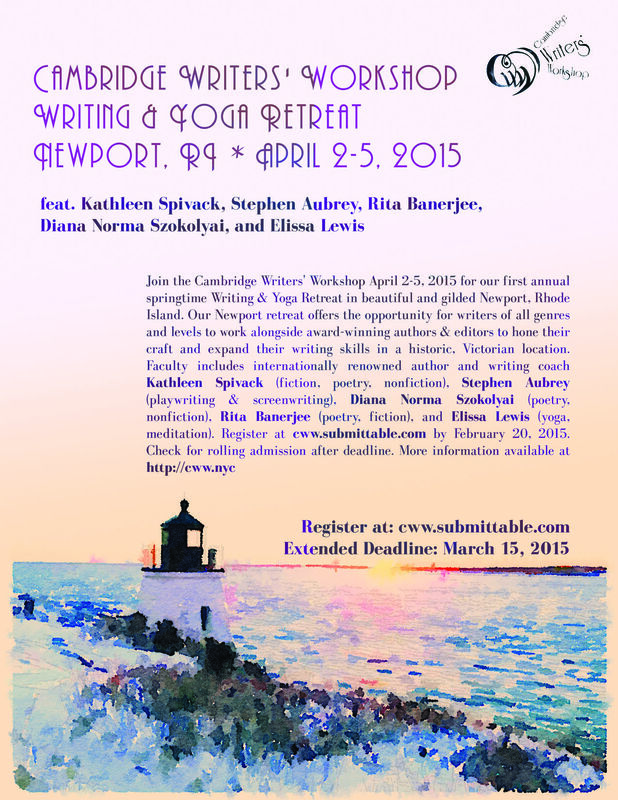 If you’d like to join us in Newport, please apply online at cww.submittable.com by March 15, 2015 and include $5 application screening fee along with a 5-page writing sample. (Due to limited seats, early applications are encouraged, but check for rolling admission after deadline, depending on availability). We encourage people to stay at the Architect’s Inn, as they are affiliated with Inn Bliss and will make your stay as comfortable as possible. They are offering a special discount for people on our retreat. Contact Nick Maione for details at (401)845-2547 and mention that you are with the Cambridge Writers’ Workshop. Discounts will depend on the particular room and number of nights you are staying between April 2-5, 2015.